In the next few blogs, we’ll be looking to give high level overviews of applying machine learning to different industries. We will first look at value that can be extracted from customer data. This is the field of Market Analytics, also known as Retail Analytics. By analyzing customers, their demographics, and purchase history, we can extract information from your data to give immediate rewards to your company. In the coming months, we will give more detailed case studies on these topics. Customer analytics cover numerous facets - indeed we have already covered several of these topics in previous blog entries. Predicting Customer Churn and Customer Lifetime Value. The idea is to create an accurate prediction of the customers that will likely stop service or stop using your goods. By determining these clients, remedial action may be taken in advance to improve retention rates, improve products and services, and prevent the loss. We construct “features” from demographic and purchase information of clients, along with typical customer information (number and length of complaint calls or emails, number of service requests, number of purchases, service length, and renewal rates etc). From here, we may use a typical machine learning algorithms – the exact one will depend on your dataset – to create a softmax probability classification of Churn between 0 and 1, where 0 indicates no chance of churn and 1 indicates customers that will definitely churn. With each customer, we now have the probability that they will churn, based on historic and current information. We can use this information to target likely churners to reduce customer attrition and increase revenues. 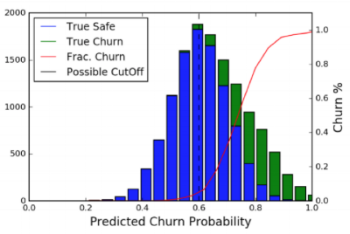 In the above figure, you can see that on our validation set, the true churners (shown in green) are found to have higher probability of churn when predicted by the algorithm. This means that for similar current users, we would be able to tell which clients need the most intervention. Further, features that are ingested by the algorithm (created from the raw customer data) can also be ranked in terms of importance to churn rate. The importance metric can be computed a variety of ways, based on the relative impact each feature has on the prediction. By understanding the raw data, we can not only rank the most likely churners but also generate a profile of why customers are likely to churn, leading to actionable insights for your marketing team to improve goods and services offered by your company. We can even go one step further to create an automated system in which to determine important variables on a customer-by-customer basis. This gives the finest granularity of information from your data at the cost of increased maintenance overhead, similar to the tradeoff in segmenting your user base into very fine clusters. Today we discussed another aspect of market analytics known as churn prediction. Predicting churn allows us to determine the clients that will likely stop your services or use of your goods and remedy them before they do. Further, by ranking the important features of your data, we can use our predictions to determine the most effective ways to retain your clients and to improve your offerings. Our next post about Customer Lifetime Value will complete our discussions on Market Analysis. Customer Lifetime Value (next one).